Inventory Source is the longest running (since 2003) and one of the most trusted Drop Ship Inventory & Order Management companies in this industry. We are headquartered in Jacksonville, FL and take pride in our ability to help retailers sell online more efficiently and more effectively. Inventory Source is the longest running (since 2003) and most trusted Drop Ship Inventory & Order Management company. We provide a range of services to help you, the reseller, create and manage a successful drop ship or direct fulfillment retail business. Our core service to our customers is syncing inventory and order data between your suppliers and sales channels. We provide a list of over 100 dropship suppliers we have already integrated with, however, we can integrate with just about any of your existing suppliers as well. Inventory Source is an inventory management software company that specializes in the monitoring, integrating, and updating product data from your suppliers to your sales platform. Please read a little more about us, as well as our role and your supplier's role within the dropshipping process. So to answer this main question with the above information in mind; we have access to your suppliers feed and our systems monitor it daily. When we first integrate your suppliers feed to your sales platform we do a fill image push to your site. This push includes all of the product details that can be found in the suppliers feed. This includes the products prices, descriptions, images, categories, UPC, and any other information that may be associated with that product. If any changes are done to the feed from the supplier throughout the day whether it's price, quantity, status, new products, we will push that data to your site if your settings are set to allow this (please see below question for more details). We also have services that we offer that can help you manage the feed to give yourself and your customers more convenience. 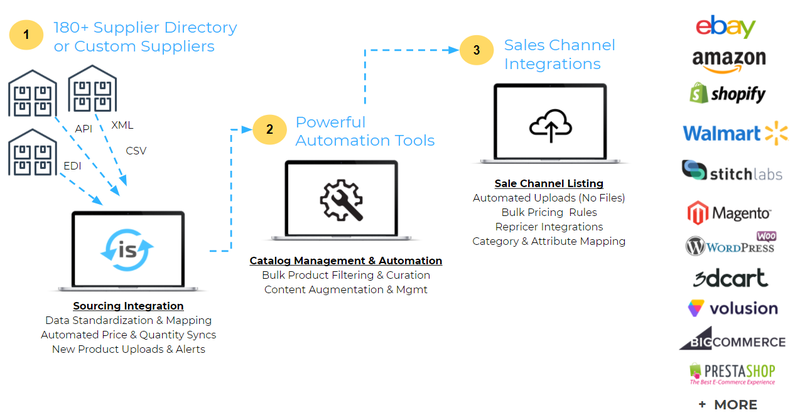 With Order Automation, variant and attribute mapping, and custom files we can manipulate the feed to best fit you and your customers. Inventory Source has been integrating dropship suppliers into our directory for over 15 years to include only trusted and fully integrated suppliers. Each supplier is initially vetted and their inventory is monitored daily to ensure all suppliers have an active and accurate inventory feed. If you can not find the supplier you want to integrate in our network, you can request a custom integration. Every Supplier Inventory Feed is Integrated & Monitored daily. Those that do not maintain an active feed are removed. You must set up an account directly with any supplier you want to sell from. Signing up with Inventory Source provides you access to our Software & Service, not the right to sell from a supplier. We are not middlemen and would not recommend you purchase from any "suppliers" that do not have an approval process or require a proof of business. Many suppliers are integrated for order automation, but not all have the capability. Please ask support@inventorysource.com to confirm if a supplier is integrated for both inventory and order automation. We have 5 services we commonly offer to our customers. Inventory Automation, Order Automation, TurnKey Shopify Store, Push to eBay Tool, & Custom Files. Our most popular service for those that already have an established website and want to add/update products to streamline your inventory management. We upload the product data from your supplier to most major e-commerce platforms and marketplaces and then sync the price, quantity, and status on a daily basis. We also provide bulk inventory management tools to efficiently manage your price markup, product filters, and categories. If you want to learn more about our this service please see our Inventory Automation: How it Works documentation. This includes both Inventory & Order Automation. Receive all the benefits of Inventory Automation noted above with also the ability to automatically route your orders to your suppliers and sync order status and shipment tracking so it can be sent back to your customer without having to manually enter into your sales channel. How does our system sync with your store's products? When we set up the integration to your system we place a unique prefix on every SKU so our system knows which SKU goes to which supplier this makes having multiple suppliers never an issue. You can see a diagram below that shows the process and why we do so.